New York Times and USA Today bestselling authors Mercedes Lackey and James Mallory first teamed up to write the Obsidian Trilogy, which was set in a wondrous world filled with magical beings, competing magic systems, and a titanic struggle between good and evil. 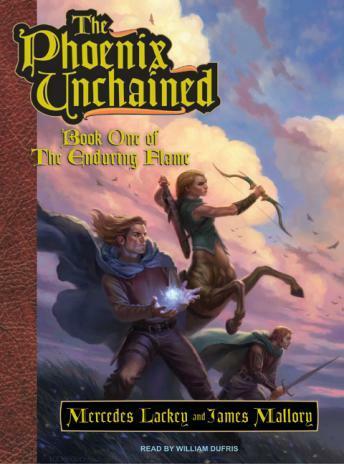 That world proved so popular with the creators and readers alike that Lackey and Mallory have returned to it again, with The Phoenix Unchained, Book One of The Enduring Flame, the opening volume of a new epic fantasy trilogy. After 1,000 years of peace, much Magick has faded from the world. The Elves live far from humankind. There are no High Mages, and Wild Mages are seen only rarely. Bisochim, a powerful Wild Mage, is determined to reintroduce Darkness to the world, believing that it is out of Balance. Tiercel, a young Armethalian nobleman, is convinced that High Magick is not just philosophy. He attempts a spell-and draws the unwelcome attention of Bisochim. Tiercel survives Bisochim's attack and begins trying to turn himself into a High Mage. Next in line to be Harbormaster of Armethalieh, Harrier instead finds himself regularly saving Tiercel's life and meeting magickal people and creatures. To Harrier's dismay, it seems that he must become a hero.